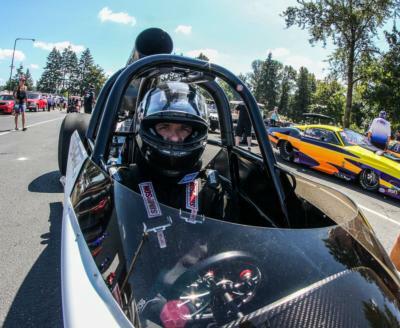 TIGARD, Ore. (December 5, 2018) - It's best to start from the beginning when it comes to this story of resurgence into the sport of drag racing fueled by the help of his fellow racers for Division 6 racer Nicholas Shepherd. After winning the Division 6 Race of Champions in 2014 and a trip to Pomona to compete with the best bracket racers in the country at the World Finals in Pomona, California, Shepherd felt that his biggest goal had been realized and he was looking for a change. "After going to Pomona in 2014 and accomplishing that goal, I just couldn't get the same energy going because going to Pomona was such a big dream of mine," Shepherd explained. "I felt like I needed a change and I sold my roadster for a dragster in June of last year and I decided to compete in Super Comp. I really wanted to race the Lucas Oil series and I like the element of a throttle stop and the intricacies of the class; I think Super Comp is the most competitive class out there as far as Lucas Oil categories and it has probably some of the tightest racing." Shepherd endured the usual "new car blues" that came with getting a new car until he had a chance meeting with Crew Chief Pro owner Don Higgins at the Northwest Nationals. "At the 2017 Seattle national, I turned on my Crew Chief Pro and it was asking for an access code," he said. "I was new to Crew Chief Pro and I called the number to get the access code and it turned out Don [Higgins] was at the race so he came over to my trailer. He looked over my numbers and told me I had it all screwed up and spent the next 25 minutes cleaning it up for me." Shepherd went on to the semifinals at the NHRA Northwest Nationals and he left the event feeling very confident in his Super Comp program. The next event on his list was the Woodburn Dragstrip divisional - a track he had made passes down countless times in his past, but little did Shepherd know, this weekend would be a little different. "On Friday night at the Woodburn divisional, I made it to the finals of the Super Comp Shootout and I felt the car was super consistent as I headed into the final round against Mike Shannon," Shepherd remembered. "I did the math and I knew I had to be about 13-feet ahead of Mike [Shannon] at the 1,000-foot mark and I remember looking over and thinking that I had a whole dragster on him, so I got on the brakes." As Shepherd crossed the finish line, with the win light illuminated in his lane, his dragster took a drastic turn sideways. The dragster ended up in the other lane upside down as it scraped along the guardrail. Shepherd was able to get out of the damaged dragster immediately after it came to a halt. "It was a brand-new dragster with 75 runs on it," he grimaced. "I was out of the groove and there's no good rubber over there and I was by the guard rail by the finish. I wasn't especially hard on the brakes at the finish line, but I was on them enough; that wreck was definitely my fault." After evaluating the damage of the racecar in the days to come, Shepherd knew there was only one solution: to get right back up and start looking for a new dragster. It just so happened that luck would be on Shepherd's side sooner than he thought. "Troy Williams won this chassis at the Fall Spring Fling and it was for sale a few days later," he said. "Someone tagged me in a Facebook post and I thought 'this is exactly like mine and what I need' so my friend Paul Nero went a few trailers over to take a look at it for me." "I don't know how it all happened, but someone got the dragster from Bristol Dragway to Nashville, Tenn. and then Chad Axford brought it to Sacramento, California and that's where my dad and I picked it up and we brought it home. We had the new chassis at our house in about 30 days after my crash." One month after his heartbreaking crash at Woodburn Dragstrip, Shepherd began the process of transferring his useable, good parts from his crashed American Dragster to the new chassis. "For the most part, everything was fine," he added. "The crash just bent the chassis up pretty good but there was no question that I wanted another American Dragster. I felt good that the car held up so well during the crash for one and I knew all my stuff could go right on the new one." On his quest to return to competitive drag racing, Shepherd has been reminded of the generosity and kindness that the drag racing community is known for. "The day I crashed, Ken Culver [Division 6 Stock Eliminator racer] donated his winnings to me," he said. "I never saw him, but he put his winnings on my burnt-up carburetor; that was really special, and the support has been unreal since that day." Shepherd would like to thank individuals like his wife April, Danny and Kris Wagnier at Quality Concrete, Rene Crunelle at RC Collision for painting the new car, Al Lyda for sewing him a new headrest, and Chris Ross with NW Wholesale for new tires. Additionally, Racertees.com for the contingency wrap, Luke Bogacki for helping him get a new K&N scoop, and American Race Cars for putting up the giveaway chassis at the Fall Fling. "Above all, I want to thank my dad," he added. "He has spent countless months and hours putting the new car together. I could have never gotten this fixed without all of his time and I really enjoyed working weekends on the car with him." Now that his new 2017 American Dragster with a 582 Sunset Engine in it is complete, Shepherd has some new goals - like every other time in his racing career. "I'm thankful for everyone and ecstatic to partner with such nice people and companies," he said. "My goal is to eventually be Division 6 champion and then my next goal would be a national event win."